There are numerous “themes” a shamanic adept encounters in embracing the shamanic lifestyle. One of the most intense and challenging is the death and rebirth mysteries. Since first being introduced to this concept in 2005, I have consciously walked through these cycles of initiation many times, to varying degrees of length and magnitude. I find it humorous (after the fact, of course) that no matter how many times I enter into a death cycle, I resist. Though the period of resistance seems to shorten each time, I still find myself negotiating with Spirit: “OK, so I did some journaling, made an offering to my apacheta, and performed a releasing ceremony at my mesa…are we good? Are we done now? Is that enough?” Ugh. As you might have guessed, surrendering is difficult for me. Yet surrender is the first step in gracefully entering the death cycle. I don’t surrender so gracefully. I usually have to get beaten about the head and shoulders for a little while before I will finally give myself fully to the experience – and the duration. In June of last year, I entered into one of the most deep, extensive and ego-liquifying death processes since my divorce 11 years previous. Yes, I bargained with Spirit (to no avail) and eventually yielded to what I knew was true in my bones: I was being asked to step into a massive void, into a deeper level of trust, and to submit to the timing. “It will take as long as it takes, and you are not in control of it,” I heard in my head. “OK,” I finally accepted. 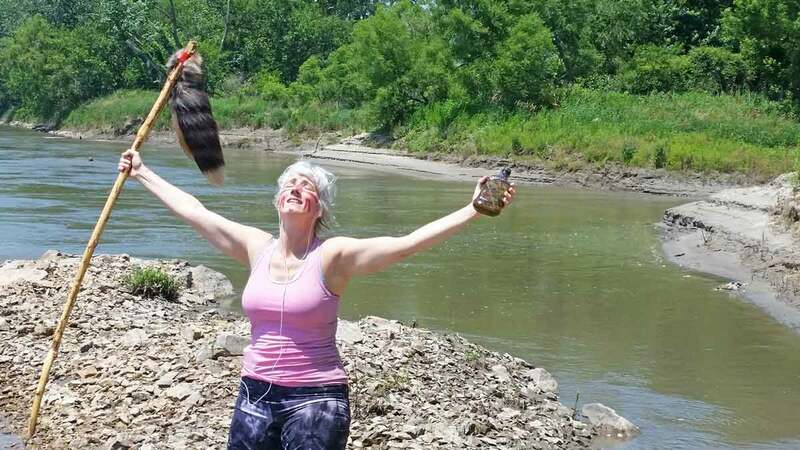 Not long after, I decided to fully embrace the process and marked my initiation into symbolic death through ceremony I conducted at the Missouri River, not far from my house. I asked my husband to come and hold space while I rattled, cried, sang, danced, anointed, painted my face, released, worked with artes, prayed, and enacted my death. You can see from the photo that I completed my ceremony by laying in the muddy silt of a side channel in the river, allowing myself to relax into the stillness and void of my virtual death. And yes, that is a slight smile you see on my face. 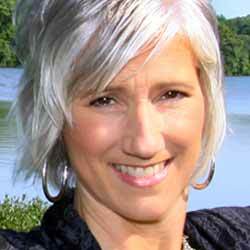 As my death unfolded over the coming months, key themes began to reveal themselves to me. Entire aspects of my personality, value system, even my energetic circuitry, were undergoing massive transformation. Through this dismemberment and loving eradication, room was being created for new teachings, new understandings, new tools. I did not recoil. I did not resist. Once I commit to something, I can be present with it and see it through. I just have to have my initial hissy fit before I will grudgingly, then obediently, yield. In my heart I knew it was all vital preparation for what my Soul was asking me to step into. Fast forward to last fall. 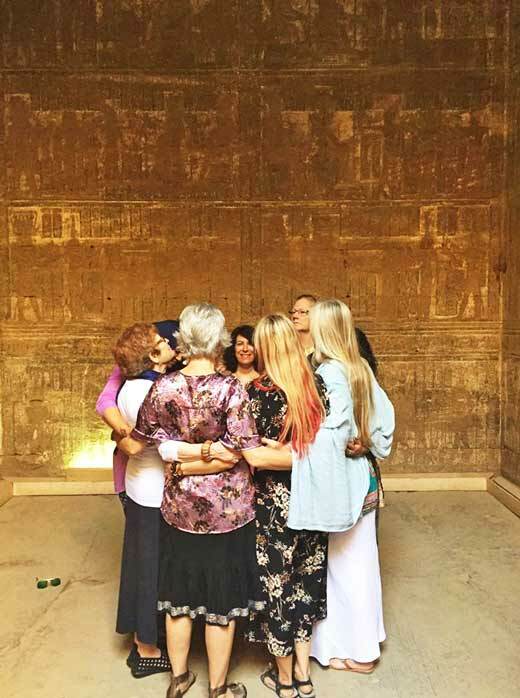 I was blessed with the opportunity to visit Egypt in October, on a divine feminine guided tour with a small group of women. I did not go with any expectation other than to be present for whatever wanted to show up. On day nine we visited the Temple of Hathor. As part of the trip fee, we were given private access to most of the sites two hours before they opened to the public. At each site we would gather first in the “holy of holies,” some special room or area that was especially significant, or contained an altar, or housed a particular statue. 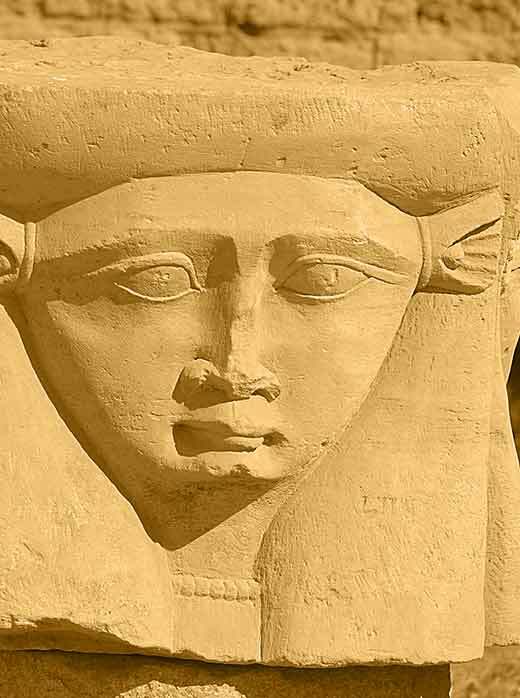 At the Temple of Hathor, we entered the birthing room and circled up to conduct our daily ceremony, which usually consisted of being anointed, quiet toning, or meditative breathing. As soon as we walked into that birthing room, I broke down. I tried to contain my sobbing while our hands were joined and ceremony was conducted. Uncontrollable waves were backing up in my body and when we dropped hands at the completion of our ceremony, I lost it. Immediately three of my sisters came to my aid…one on the left, one on the right and one in front. Though it didn’t cross my mind until later, I was incredibly grateful – indeed it was a miraculous gift – that I was able to stand in that room and wail for many minutes without guards coming to break things up or shoo us away. It was clear that time sped up for those several precious minutes, during which I released decades and lifetimes of pain, fear, trauma, and suffering. My dear friend, whom I traveled with from Kansas City, was standing in front of me and intuited the appropriate moment to redirect the energy. She asked me a few questions, which I don’t remember, but her questions invited me to then shift my energy into a space of allowing. Again, time was accelerated as I received massive downloads of energetic pulses, clarity, ancient memories, and access to different dimensions. When the process came to a natural conclusion, I literally could not walk. The two women on either side of me supported me as we left the birthing room and navigated the corridors. I remember saying something to the effect of, “I feel like I’m walking on new legs.” I was dizzy, altered, and buzzing. It wasn’t until later that I realized the significance of what had happened: I was reborn in the birthing room in the Temple of Hathor. The goddess of love, beauty, pleasure, joy, dancing, and music. You can see us in the birthing room in the photo (that’s me in lavender with my back to the camera). Thank God for the arms that were holding me up. Though I know this is not the last time I will die and be reborn, each cycle allows me a more revealing glimpse into its mysteries. Each glimpse imbues me with more trust in the process. And the deeper trust allows me to surrender to my next death with more humility and grace. And a little less hissy fitting.